If you’ve seen the movie “The Perfect Storm” or read the book with the same title by Sebastian Junger you know the story surrounding the swordfish boat, the Andrea Gail. 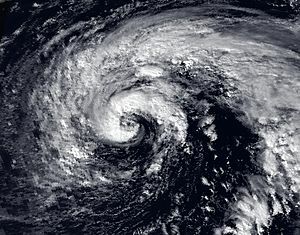 On October 28, 1991 two storm fronts converged with Hurricane Grace in the Atlantic Ocean to form a monster of a storm. The Andrea Gail was caught in the middle of it and all six hands on board perished. For authors, this convergence of storms happens occasionally as well. I call it the author’s perfect storm and it looks something like this: promoting an upcoming or just released book, editing another book, writing yet another book on deadline. I’m gearing up the promotions and planning for the October 16 release of my first Michael King novel, A Thousand Sleepless Nights. I’m in the middle of editing my next thriller, Fearless (releases Feb, 2013). First round of edits are due October 1, final edits are due November 1. I’m writing my next Michael King story, A Million Miles From Home, due October 1. As you can see, there’s a lot of overlap there. So how do I handle something like this? I do what I can. Right now I’ve set the writing of A Million Miles From Home aside to focus on the edits of Fearless but I’m continuing to plan for the release of A Thousand Sleepless Nights. I’m just hoping I don’t capsize in the middle of this. What does your perfect storm of life look like? Are you in the middle of a convergence of major events? Posted on August 14, 2012, in Writing craft, Writing Life and tagged Andrea Gail, atlantic hurricane season, Atlantic Ocean, Hurricane Grace, Michael King, Perfect Storm, Sebastian Junger, storm fronts, storm of life. Bookmark the permalink. 12 Comments. I honestly don’t know how you do it. That’s why I pray a lot for you. I would panic and think, what if nothing comes? What if I go blank. Then again I’m not an author. Maybe those things don’t really matter. My major events have been going on for about 20 years straight. That is when all the surgeries started. You know about them. The really major events started 8 years ago. Not just my health. My sister moved in for two years. She left. Mom and Dad moved in because Dad has Alzheimers. Dad went into a nursing home 4 years ago and Mom can no longer take care of herself so she moved back in over 3 years ago. My father in law sold his house 2 years ago and decided he didn’t want to pay rent and moved in with us. I can barely take care of myself but am trying to take care of everyone else also. I have sisters and my husband has 3 brothers, but let Terry handle it. I know this is my family and responsibility but some days I just want to run away from home. Childish, huh? I don’t expect it but get paid nothing for paying their bills, taking them to the Dr. Taking care of all the paperwork of which there is tons. My hsband and I have not been alone in our own home for eight years. Well, we just put it up for sale. We are going to really downsize to try and be ready for retirement. Parents will have to spend time with other family. I love them but can only take so much. OK, how much do I owe you for getting all that off my chest? I know other people are in the same situation so I shouldn’t complain. Terri, sharing your burdens isn’t complaining. Complaining is a state of heart and I think you share for the right reasons. You have a lot going on there and it sounds like a tough situation. You and your husband need time for each other. I pray God gives you the wisdom to know how best to handle this situation. I am so deficit in the ability to multi-task that perfect storms seem to be my climate, and it’s funny because I so admire my dad’s gift at multi-tasking and working under pressure, but he struggles when five things aren’t attacking him at once. My wife is the same as he, (along with the platypus, magnetism of polar opposites is pure irrefutable evidence of God’s sense of humor) and I think she purposely keeps things chaotic just so she can function. Best wishes and prayers as you clear your plate Mike. Sounds like maximum overload! Then again, I think I’d rather be slammed to the wall with writing demands than waiting to see WHAT I need to write next. I’d rather have some direction than no direction at all, which is where I am right now (out on submission). Before pouring more hours of time into researching the next Viking novel, I have to know this one is going to fly. Bad place to be for a goal-driven person who thrives on deadlines! All the best to you as you juggle your goals, Mike! Thank you, Heather, for giving me perspective. I am very thankful I have the writing assignments and things to keep busy with. I know how blessed I am and don’t wish it away, it just makes things tricky for a time. That’s a lot going on! I’m pretty sure I couldn’t handle the pressure of that many pots on the fire, but know that there’s a lot of people praying for you and believing in the messages that the Lord has given you to share through your books. Personally, my ‘perfect storm’ is more of my own making. I’m not really able to work on my writing while at work and I work eleven hours a day. I tend to get home and sit on the sofa and just veg. This is really bad considering my second book is only lacking a few edits before printing. (I have no deadlines since it’ll only be printed, not published. But I do have about 30 people asking me when they can read it, so I need to get on it.) There are other things going on, as well, but that’s life. It’s never one thing at a time and I hate to admit it, but I’m one of those people who tends to shut down when overwhelmed. That’s something I really need to work on. It’s easy to do that, Melinda (shut down) and tempting! I find it’s so easy to get distracted with other stuff when so much is pressing for attention. Focus is something I work on every day. I’m not in that kind of a storm. I will pray for you. My storm is that I just returned from a mission trip to Panama and need to get back in the grove. I returned with some health issues and a broken computer that has all my writing on it. That makes it very hard to get back on track. I’m having to go to the library just to follow my blogs and write my own. Praaise God I should have my computer back soon and my health is returning to normal. God bless you. My “perfect storm” was in June/July 2011. My husband, three-year-old daughter, and I were told by our landlord that we had sixty days to move out of our rental. It was a very old, large mansion-type house that we were care-taking–long story, but we wound up living in this place for a very low rent. The owner changed his mind about the lease renewal and wanted us to move out ASAP so he could sell it. The problem: I was seven months pregnant when he told us he wanted us out, and the lease expiration would occur at week 38 of my pregnancy. We scrambled to find a new place, then our church pitched in and helped me pack, clean up the new place, clean out the old place, and get ourselves moved during week 37 of my pregnancy. They also assembled a team of ladies to care for my three-year-old for me during this process. The day after we moved the last bit of stuff into the new place was July 4. We had two weeks to go before the baby’s due date, so my husband and I started our strategy on how to best unpack and settle before baby’s arrival. We were surrounded by a sea of boxes, and we didn’t know where anything was. During our midday conversation, I said, “Marc, I don’t feel so well.” Yep, I was in labor, two weeks early. While I was in labor, I went shopping, because with all the chaos, I didn’t yet have what I needed for the baby’s arrival (like videotape for the camera). While I shopped (leaning on the shopping cart for support with each contraction), Marc scrambled to get things ready at home and get bags packed for us and our three-year-old. It was a holiday, so none of my friends who said they’d watch the three-year-old were home. We got everything squared away, finally found a friend to keep our daughter for us, and that night at 1:51 a.m., baby arrived. She was born at a birth center which required us to go home 12 hours after the birth. So the next day, there we were, back in the middle of the chaos, but with a newborn to care for, and me in recovery. After reading these comments, I’m finding it hard to call my situation a storm. I’ve actually been inspired to push through and get things done. It’s mainly my desire to write when I’m bright and awake versus having to wait until the evenings after a long day at work and use a cup of coffee to stay awake. I realize that having any time at all is a gift. Thanks for helping to make that clear with this post. From what I’m learning about you, Mike, via your blog, I have a feeling you’re going to make it through this one just fine.